The south is rich with tradition. My daughter, Brielle, asked me to have her bridal accessories designed by September 11th in time for her formal bridal portraits at Tuckahoe Plantation in Richmond, Virginia. 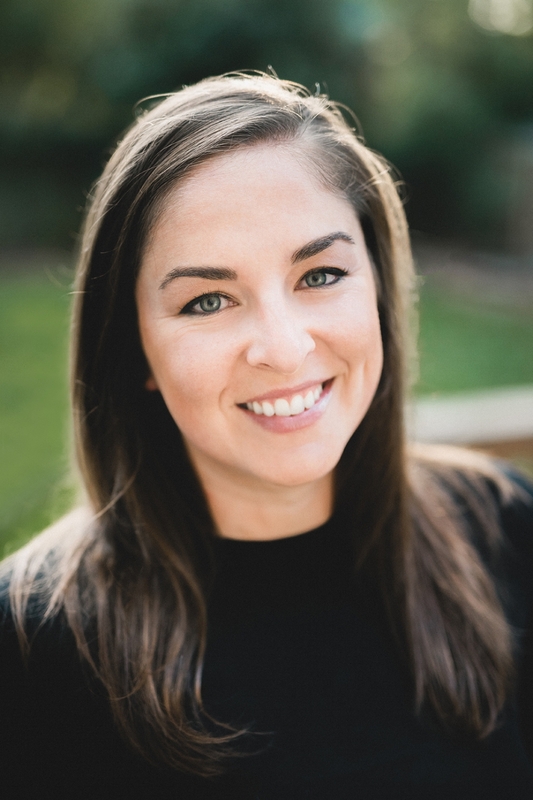 Brielle came to love so many southern traditions after spending years studying and working in Richmond, Virginia, and Charleston, South Carolina. She also became a lover of grits, sweet tea, and country music. Now that October 14th has passed, we can begin to reveal all we planned and designed over the past fifteen months. First things first...Brielle's wedding gown and veil! 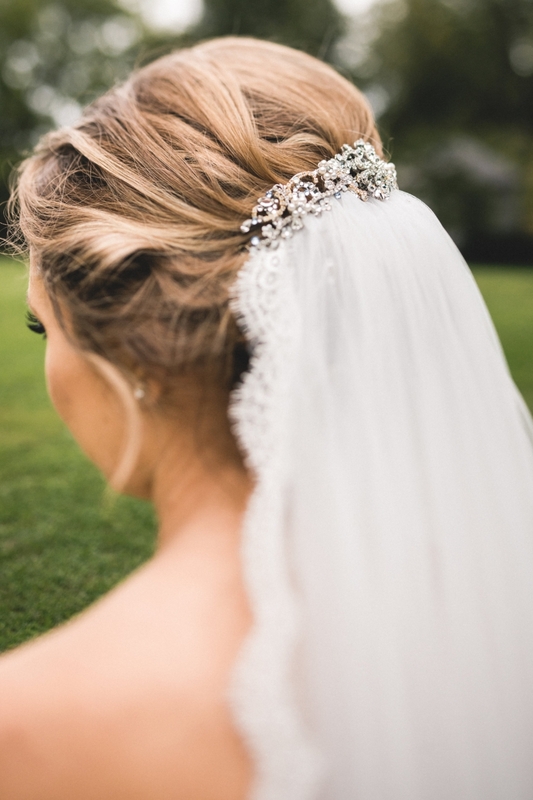 After designing an exclusive bridal accessory line for many years for Something Bleu Bridal in Saratoga Springs, N.Y., I knew this crème de la crème bridal salon was the perfect setting for Brielle to find her gown. Brielle's bridal style vision was "timeless", and she found that in the Valentine gown from the Astrid and Mercedes Collection designed by, Canadian designer, Lea-Ann Belter. Quality in design was most important to me while looking for her gown. Any wedding dress chosen from the collections of Lea-Ann Belter would satisfy my discretionary eye for quality and craftsmanship. When Brielle tried on Lea-Ann's Jacqueline lace jacket over the Valentine dress, she realized this was exactly what she was looking for. Brielle knew she wanted a long veil for her ceremony and this veil design was my first draft made of imported European net and French laces. Denise, the owner of Something Bleu Bridal, offered us an amazing personalized experience. She opened her salon after hours for an additional visit to make sure this Virginia bride was absolutely certain about her choice. On September 8th, I packed the car to the ceiling with venue decor and Brielle's wedding dress and accessories. The next five days in Richmond were filled with appointments for final wedding planning and culiminated with hair and makeup trials for her bridal portrait session. All of my bridal clients make appointments for hair trials but usually after they arrive back home they take down their hair and wash it out. Brielle's idea was to make good use of her hair and makeup appointment at Avenue 42 Style Studio. Makeup trials are just as important as hair trials. Both hair and makeup trials allow you to figure out the kinks and tweak both to perfection for your wedding day. Shooting bridal portraits on your trial day takes it to another level! Brielle chose an incredible location to shoot her portraits. To get a feel for exactly how beautiful Tuckahoe Plantation is, please enjoy this minute to view it by air. 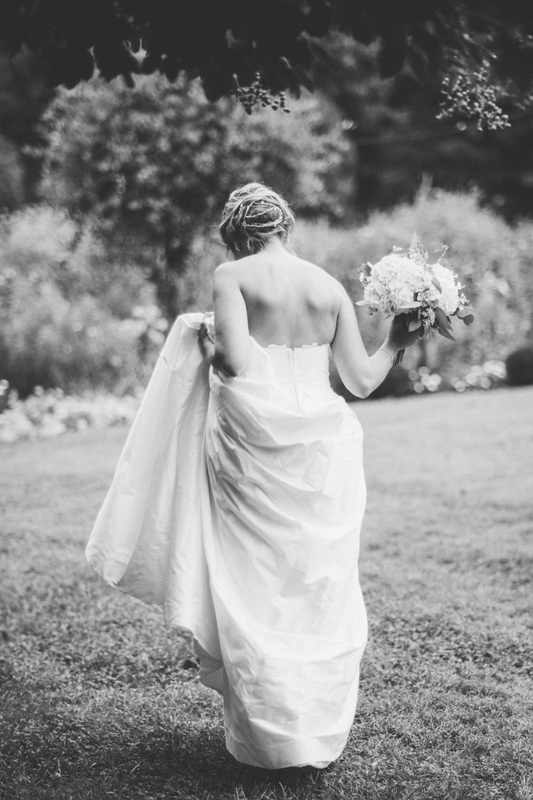 Allison Kuhn is a wedding and lifestyle photographer based out of Richmond, Virginia. Her husband, Travis, is her second shooter and also a drone pilot. One of the things Brielle loved about her from the start was that she was down to earth and asked to meet over a glass of wine. Brielle and Alex met Allison at the Blue Goat in Richmond. Alex was happy to find out that both Allison and Travis were Virginia Tech grads where he also received his Masters Degree. It was determined early on in the evening that Allison would be the one behind the lens on their wedding day. She offers a complimentary engagement session or bridal portrait session with her wedding day photography services. This leads us to Monday, September 11th. Brielle asked me to come along to help with her dress and accessories on her bridal portrait day. I took a few pics to remember all that went into this day. It was a beautiful experience! I am a lover and admirer of all who take the journey to master a craft. It takes years to develop who we are. The cool thing is... as creatives, artists, or designers, we are constantly developing and each experience brings us to a new place. 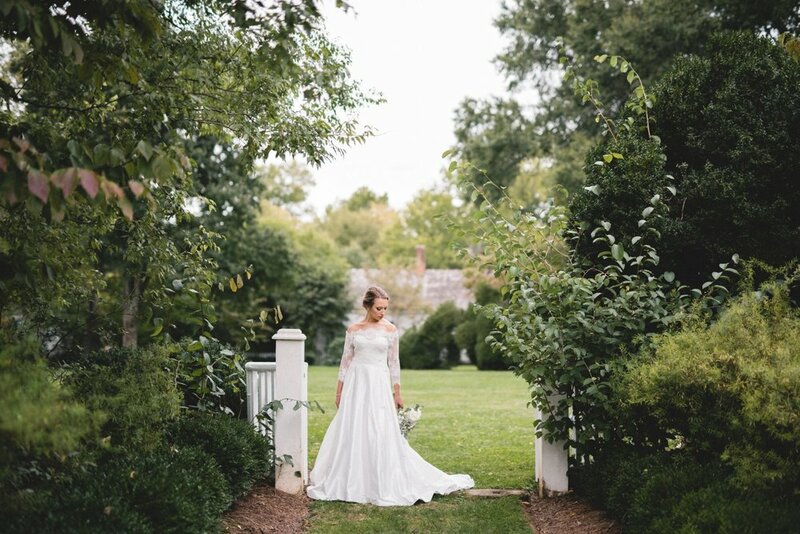 Allison met us at the picturesque Tuckahoe Plantation and captured amazing photos while sharing her expertise with us. I asked Allison to give us some background on bridal portraiture. She said, "As you know, bridal portraits are a very southern tradition, but I am not sure why, since the idea dates back to a time (rather than a location) when having a photographer at your wedding wasn't the norm. Instead of having a photographer follow you around on your wedding day, wedding portraits were taken in a studio prior to the wedding day. So you'd think that the tradition would be common everywhere! For some reason, even as technology has evolved, the tradition of the bridal portraits has stuck around in more southern states. And although Virginia has historically been considered the "south", in my opinion, Virginia/Richmond is really more of a blending of northern and southern traditions. I think that's why many brides are aware of the tradition, but it's not necessarily the "right of passage" as it is in more southern states. I still have to educate some of my brides on what a bridal portrait session is and why it can be both a fun and practical experience." Allison Kuhn goes with the moment, knows how a garment should fall, and encourages her subject to be natural. She gives her time, her love of the camera, and wishes to provide you with the best moments of your life stamped in time. "Bridal portraits allow the bride to get comfortable with being photographed and being the center of attention. Not everyone naturally gravitates towards the spotlight. In some cases the idea of a wedding (getting all dressed up and having eyes on you) can make even the most confident bride self conscious," says Allison. "Bridal portraits are a great trial run to see how everything is going to look and feel when it all comes together. You put so much time, effort, and money into how you are going to look on your wedding day and sometimes it's hard to envision how all of those puzzle pieces (your dress, hair, makeup and accessories) are going to look when put together. Doing this before your wedding day allows you to figure out what you like or don't like ahead of time. You can decide to make alterations to your dress, switch up your hair or make-up, or add or subtract accessories if need be. Why would you wait until your wedding day to see how you are going to look?" "A bridal portrait session allows brides to feel more confident on their wedding day knowing they have made the right choices about their attire. From my standpoint, a bridal portrait session gives us time (which we don't typically have on a wedding day) to get lots of different detail shots and various poses with a variety of backdrops. It allows me the opportunity to discover the best angles and create the most flattering photos for each bride...instead of learning those things on the fly on the wedding day. I absolutely love having this time with my brides. " Just four weeks ago on, October 14th, my intentions were to post a sneak peek at midnight at the end of Brielle and Alex's wedding reception. Time got away from me. I found myself designing for the wedding up until the bridal luncheon on October 13th. The great thing is, I have so much yet to share with you all. In the meantime, please enjoy this little peek into the wedding day of Brielle and Alex. We will be seeing you again next month on the "Fourteenth". 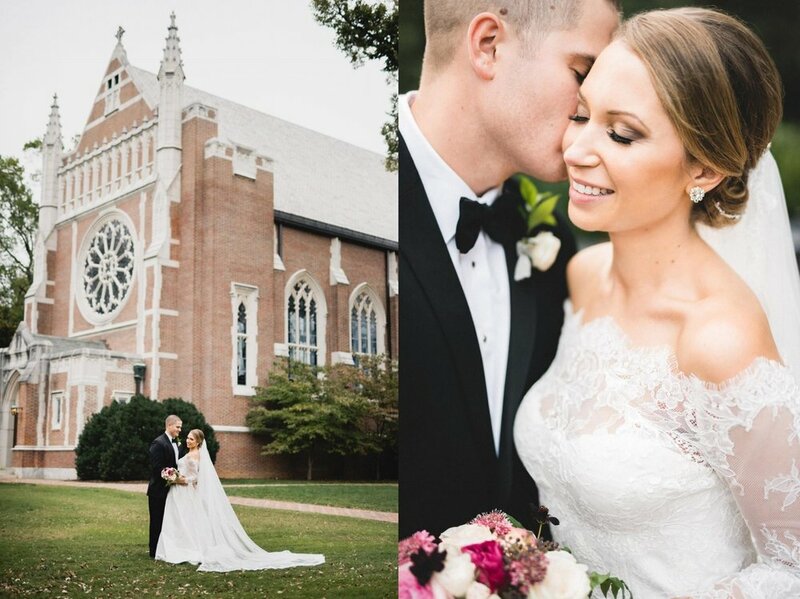 Mr. and Mrs. Alex Maffett at Henry Mansfield Cannon Memorial Chapel, University of Richmond, on October the Fourteenth. Photography by Allison Kuhn Creative. Allison and Travis have photographed weddings all over the country. They are passionate about traveling, experiencing new things, and expanding their horizons.